Yeah, I like the illusion that I’m getting something for free. In this case, I’m sure it was one of those send in x number of proofs of purchase and we’ll send you a poster. I’ll bet I had more than enough at the time this was released to send for it. And after I got it, it sat rolled up in a tube for a number of years. I remember coming across this poster when I was ordering frames for movie posters and thought it would be a neat thing to hang next to my collection. So, I went ahead and ordered a specific frame for it. 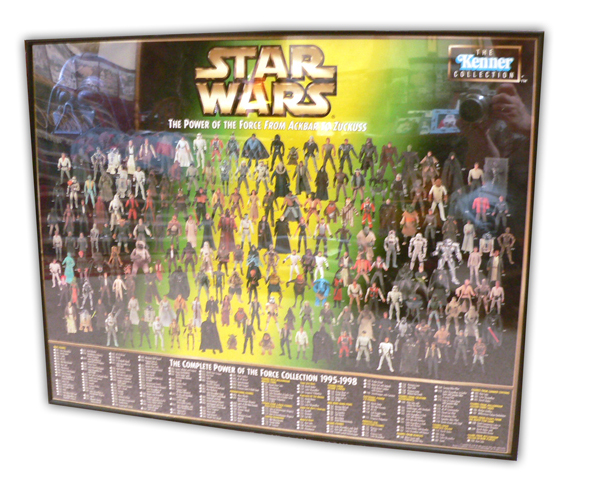 The poster is essentially a checklist for the POTF2 collection. That’s “Power of the Force 2” for the new folks out there. Essentially, the original line that brought Star Wars figures back to shelves in the 90’s. There all there from the cereal Han Solo to the hard to the Episode 1 preview figures. It serves as a reminder for the days when I really did try to get one of every Star Wars figure. There are a few figures here I don’t have. Not many, but a few. Awesome poster!, I really like it. I wish I could have got some better pictures. Out of the 20 I took, that is the only one I got that I could use.